The game takes place at a creaky old inn, which TV shows and movies have taught me is where 95 percent of all murders occur. 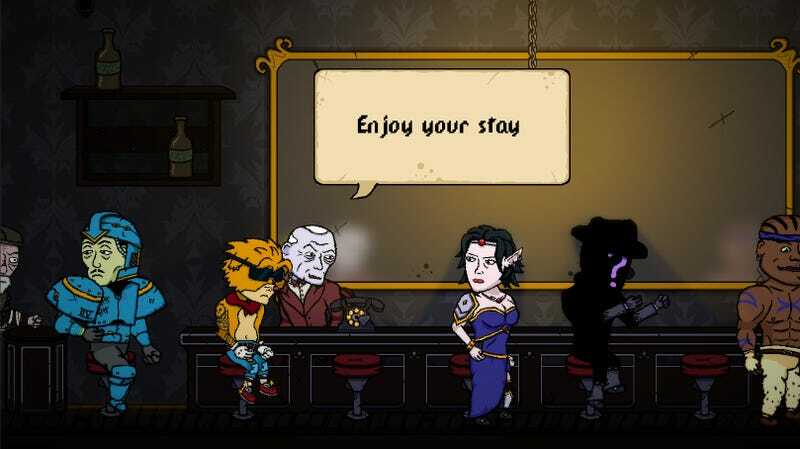 As the game’s Steam page explains, the characters are “video game protagonists trying to escape their past,” but unfortunately for them, the inn “ has a way of bringing back old memories.” You play as each one of the characters, and during each of their routes, they’ll need to explore the inn and delve into musty old memories. The fun part is, each character’s memories play out in their preferred genre. By the time you’ve played all the characters’ routes, you’ll figure out who the murderer is. The game checks all the boxes when it comes to video game protagonist archetypes. There’s a grizzled space marine, an elven sorceress, a ‘tude-having ‘90s platformer hero, a musclebound fighter, a hollow-eyed apocalypse survivor, and my favorite: “the first-person perspective,” a character whose face is obscured by a giant question mark. As you play, you’ll unearth skeletons from these characters’ closets, and since these are trope-y heroes trying to escape their pasts and all, they’ve got plenty of bones lying around. Darker than murder? Normally I’d be skeptical of that claim, but this is the person who made Pony Island. Coming up with something more grim than the premeditated end of a human life would be right in his wheelhouse. The Hex will be out on October 16.